The new Makasutu Training Centre opened by The Gambia Horse and Donkey Trust, thanks to generous donations and support from many quarters. 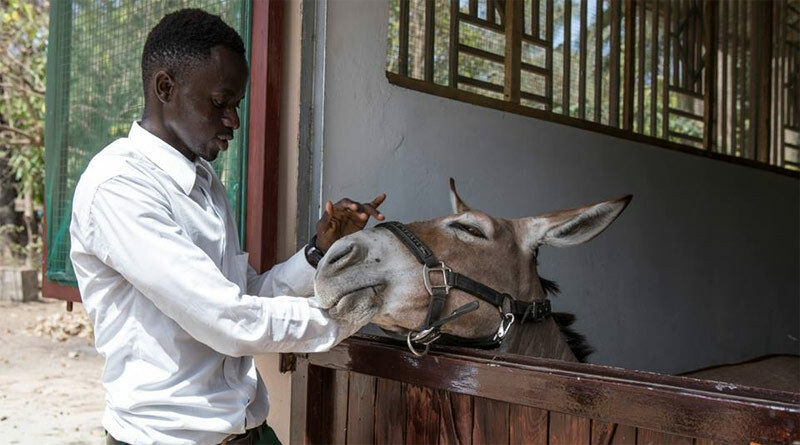 A groundbreaking new training centre and hospital has been opened in Gambia to help improve the health and welfare of the working equines in the country. The new Makasutu Training Centre and The Derek Knottenbelt Veterinary Hospital have been opened by UK registered charity The Gambia Horse and Donkey Trust (GHDT), which has a major focus on educational animal welfare programmes to equip locals with the knowledge and skills to solve their own problems. The new centre is a resource for training both Gambian and overseas vets, as well as providing support for the animals in the coastal region of The Gambia and their owners. It will provide access for Gambian students to learn veterinary skills and skills required for other equine related professions, and will also provide a gateway for UK professionals to learn more about tropical diseases which are fast becoming a real threat for equines in Britain. The equine hospital consists of stabling for 20 patients, offices, a visitor centre and a lecture room, together with accommodation for volunteers, students and staff. The first training sessions for students in the Higher Diploma in agriculture got under way as soon as the centre opened, with 68 students participating. The sessions were conducted by XL Vets along with The Gambia Horse and Donkey Trust’s own vets, Dr Demba Jallow, Dr Abdou Ceesay and Dr Kebba Daffeh. Further courses will be held each week at the centre. The new Veterinary Hospital in Gambia, named in honor of British vet Derek Knottenbelt. Much of the centre has been built with donations, along with generous financial support from the Vets with Horsepower Team, The Jean Sainsbury Trust and the Elise Pilkington Trust. The Vets with Horsepower Team supported GHDT for two years, giving their free time touring Europe and Ireland on motorbikes giving lectures at the end of every day to raise funds. The bathrooms in the new centre were donated from Kohler Mira, the X-ray machine from BCF Technology, the endoscope from Burtons, and Wickes generously discounted hospital and pharmacy kitchen units. The charity relies heavily on volunteer vets, farriers and harness makers from the UK for their expertise, and they have provided essential training and services to ensure the sustainability of the GHDT’s work. The inaugural course at the Makasutu Training Centre was attended by 68 students, and conducted by XL Vets and three GHDT veterinarians. GHDT Charity Director Heather Armstrong said when she walks around the centre she is reminded of all the people who contributed to it. “Apart from the money it took to build it, so many volunteers have helped with the building, painting, sanding and design. It has been a joint effort and everyone has left a little piece of themselves here,” Armstrong said. Learn more about The Gambia Horse and Donkey Trust.